1. Re-started a top down hat 4 times before giving up and starting from the brim. 2. Started to machine quilt a bed sized quilt only to discover that I haven’t got anywhere near enough thread. 3. Got frustrated with my sewing machine (and my ability to manipulate and use it) when the tension won’t set correctly. 4. Had a tantrum at my sewing machine because the tension still isn’t right even though I’ve got the settings how they should be. 5. Hidden under my duvet and sulked. 6. Told H that he could throw my sewing machine out of the window. (He asked what he could do to help). 7. Held the screws to the footplate, while H took my machine apart and delicately removed a veritable pillow of fluff from its innards. 8. Sewn sample after sample to check that the newly set tension was going to quilt nicely. 9. Rescued the quilt in question from behind the sofa where it had been flung in a mixture of disgust at its (my) failings and denial of its existence. 10. Run out of thread. …. I give no such assurances as to yesterday. 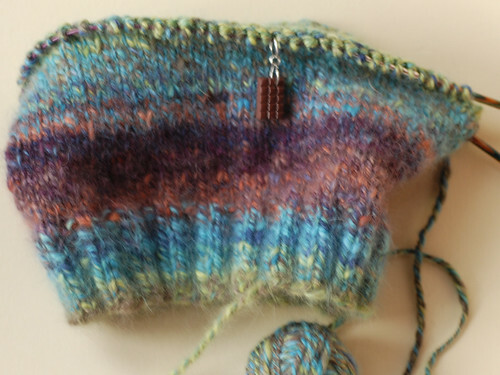 I like top down hats after the first inch when the needles have stopped falling out. I usually have four circular cast ons per hat, it keeps me humble. This cracks me up (in the ‘I’m not really laughing at your pain’ kind of way). I hope that your crafting time has been less stressful and painful as of late!